Gaming sites that let you play provably fair dice games and allow you to do sports betting continue to be on trend. They have become go-to sites for sports enthusiasts and gambling buffs alike. Given these, you may want to consider being a partner of any of these casinos in hopes of earning big bet shares. Do not forget, though, to include Nitrogen Sports and OneHash in the list of brands you hope to market to players. We will even help you settle your doubts as we give you this Nitrogen Sports vs OneHash Affiliates article. This Bitcoin casino affiliate comparison might just turn out as your reason to settle for a program that will best suit your likings. To start your judging, know that Nitrogen Sports affiliate program is brought to you by Nitrogen Sports, the largest Bitcoin sportsbook online. It is here where you can find the widest range of sports betting games. On the other hand, OneHash affiliate program competes well as it will not give you a hard time in giving your players a lot of game choices. OneHash, after all, is also a large sports betting site. Read through this Nitrogen Sports vs OneHash Affiliates write-up to know more than just the comparison of the lengths of their sports betting lists. Your biggest Nitrogen Sports vs OneHash Affiliates consideration should be the earning plans. You have to know that both of these Bitcoin affiliate programs do not give rev shares. Rather, they offer volume-based profits. As a Bitcoin affiliate of Nitrogen Sports, you are to earn 0.3% of the total bets of your referred players. Whether they win or lose, you get this share. 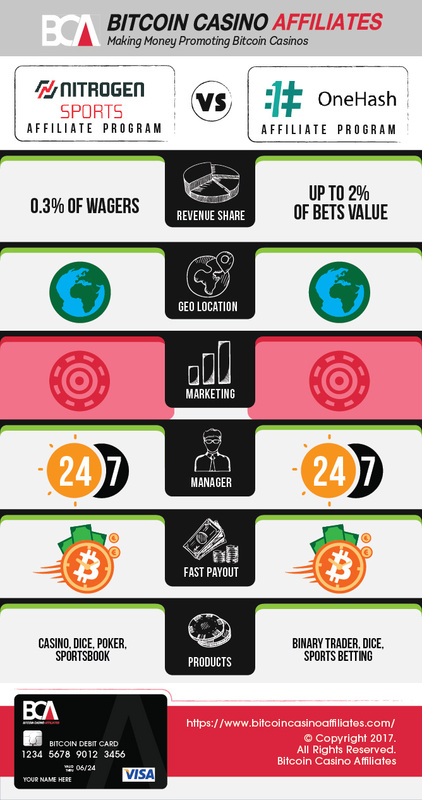 OneHash, on the other hand, will pay you up to 2% of the bets placed by your invites. With a bigger bet share offer, the Bitcoin gambling affiliate program of this gaming site is a big step ahead of its rival. No matter how big a program’s pay is, earning it is hard if there are no effective marketing tools for you to begin with. You should, therefore, be keen about the tools offered by your prospective casino partner. To help you, this article points out to you another difference between the rivals. Nitrogen Sports gives you custom banners, stat reports, and ad flags. OneHash equips you with links, banners, videos, and landing pages, among others. It is obvious, then, that OneHash takes further steps, at least in this Nitrogen Sports vs OneHash Affiliates section. As far as Nitrogen Sports vs OneHash Affiliates payments are concerned, know that both programs give real-time payouts. Since Nitrogen Sports and OneHash are both Bitcoin betting sites, you can expect instant transfer of earnings to your wallet. As soon as a sports event concludes, your share from your players’ bets tops up your account. You have to take note, though, that Nitrogen Sports is your winner in this section. The gaming site allows you to cash out any amount anytime. This is unlike OneHash which has weekly payment schedules. The least you can withdraw at OneHash is 0.001 BTC. This analysis also cares about your access to support. The more accessible your affiliate manager is, the fewer worries you will have. It is, therefore, important that you are aware of how you can reach the support team of either program. The good thing is both the programs have a support team reachable 24/7. Despite lacking any live chat assistance, the programs can still answer your concerns via email. To conclude this match-up, we lay down an overall assessment of both programs. While it is undeniable that Nitrogen Sports offers more betting events than its rival, OneHash gives bigger bet shares. Although a wide betting library is attractive, it is the earning plan that draws people more to a casino. You also have to note that OneHash takes the lead when it comes to marketing tools. As they say, the effectiveness of tools in marketing is a big factor affecting one’s profitability. But if you are after the instant access to payouts, give Nitrogen Sports a score. It allows you to cash out anytime, compared with OneHash which has a weekly payment schedule and a minimum withdrawal set. Lastly, this Nitrogen Sports vs OneHash Affiliates contest asserts that it is a tie between the two programs in terms of support. Both communicate with their partners via email. As this may not be as big a deal as the previously mentioned points, it is then fair to declare OneHash affiliate program as the champ.